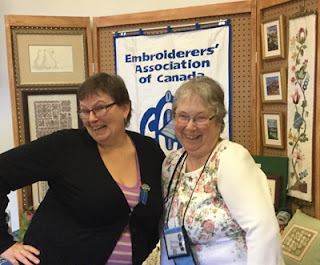 Embroiderers' Association of Canada, Inc.: EAC at the NS Fibre Arts Festival – Awesome! It all began with a visit to the Nova Scotia Fibre Arts Festival in Amherst, NS in 2015 and culminated with EAC having a venue in the 2016 Festival under the direction of past members of the EAC Board, Joyce Gill and Sheila Stewart. 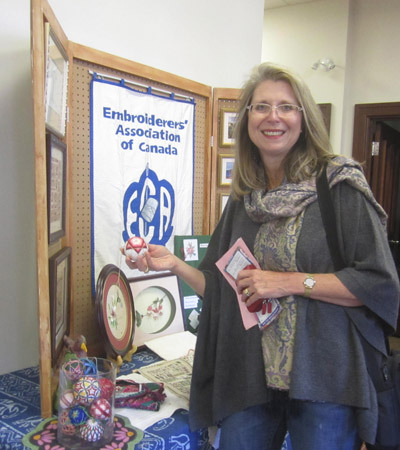 To say that being part of the NS Fibre Arts Festival was a truly exceptional experience would be an understatement. From the moment the planning team was contacted to the packing up of our venue, we were truly blessed with willing help at every turn, smiles – and coffee, tea and treats on site! 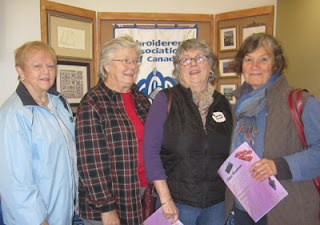 Joyce arrived from PEI and Sheila from central Nova Scotia in – what we thought – was lots of time to set up our venue. 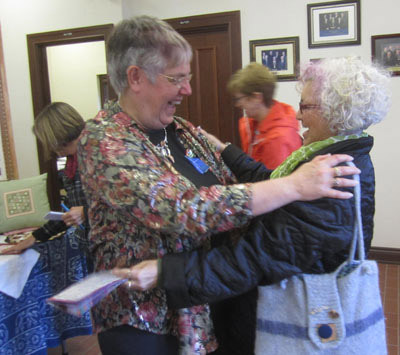 We were absolutely astounded with the wonderful space allotted to us at Festival Headquarters, in Amherst Town Hall and in the assistance given us in finding tables and setting up! What seemed to draw the most attention were Joyce and Sheila’s pieces they brought to stitch on. 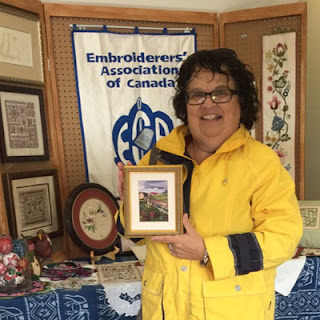 Joyce had brought a thread painting that she was working on – a reproduction of her photo of the Confederation Bridge between PE and NB – and Sheila had brought the canvaswork Mystery Project from the EAC magazine, Embroidery Canada, March, June, September 2004. 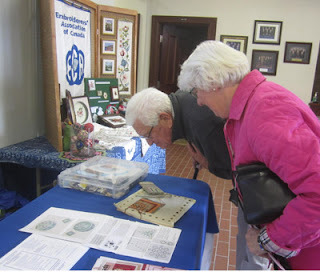 Both had brought pieces finished in their technique so visitors could see the work in progress and compare it to the finished product; they actually went away feeling that this handwork was something they could do! 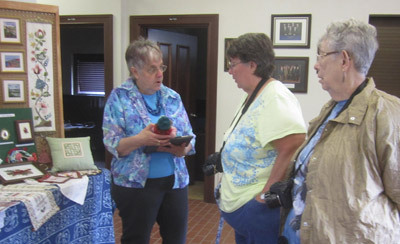 Lady’s Slipper Guild member, Kent Pond, arrived on Saturday to lead an embroidery class and stitch-in. Visitors were enthralled by the large piece of cross stitch he was working on; he also brought WIP’s (works in progress) – a sampler for a friend and a piece of hardanger embroidery worked in non-traditional colours of variegated green and oranges on green fabric. 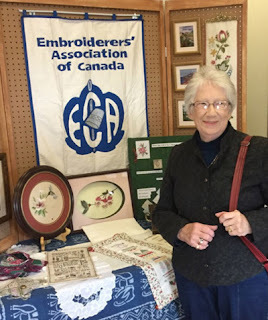 The class/stitch-in included work in a new-to-us technique – punch needle – and work on samplers reproduced from those worked in centuries past. We were welcomed over and over; people were eager to hear that embroidery guilds were alive and well across the Maritimes and, indeed, all of Canada and around the world through our cyber guild. Information on the various Maritime Guilds, the Cyber Guild and EAC membership as well as copies of Embroidery Canada were given to those interested. have been exposed to the caring and sharing that is part and parcel of the Embroiderers’ Association of Canada. All in all – an awesome experience!